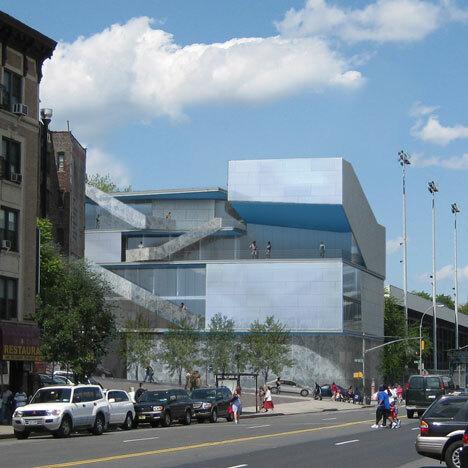 Construction has started on a new sports centre by architect Steven Holl for Columbia University in New York. Staircases will climb the blue aluminium exterior of the five-storey Campbell Sports Centre, leading to balconies and terraces at each level. The building will provide offices, classrooms and an auditorium to accompany the existing outdoor Baker Athletics Complex just beyond. The sports centre is scheduled to open in the autumn of 2012, in time for the new term. Some completed projects by Steven Holl include a wave-shaped museum of the sea and a horizontal skyscraper - see all the projects here. New York, NY—The Campbell Sports Center at Columbia University celebrated its groundbreaking on October 15th. Designed by Steven Holl Architects, the Campbell Sports Center will form an inviting new gateway to the Baker Athletics Complex, the primary athletics facility for the University’s outdoor sports program. The Campbell Sports Center, a five-story, 48,000 square foot facility, will house ￼strength and conditioning spaces, offices for varsity sports, an auditorium, a hospitality suite and student-athlete study rooms. 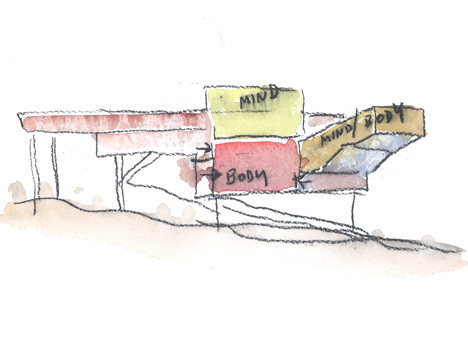 The project, led by Steven Holl and senior partner Chris McVoy, is scheduled to open in fall 2012.